TECHIES! 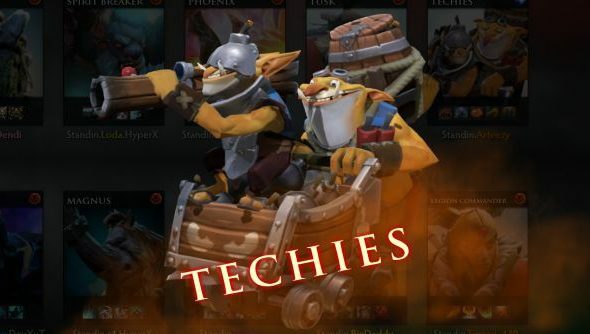 That’s right, just as predicted Valve gave a spectacular debut of Techies in the All-Star match last night during the Dota 2 International main event. His absence has been the talk of the Dota 2 community for years, so there’s little surprise that both the crowd and internet went berserk. Rumours were flying around KeyArena and the internet alike all tournament long that the debut would happen in the All-Star match, but with Valve’s track record of delayed releases no one could ever be certain. With the day’s games over and done, the time for the All-Star match arrived. As the players were introduced and took their seats, they began to draft. Everyone was eagerly searching for any sign of Techies, but none could be found. As it came down to the last pick of the game from EG’s Arteezy, everyone waited with baited breath, but Sniper was the hero he chose. You could hear the audible disappointment from the crowd. Valve love to tease, and this was probably their cruelest tease yet in Dota 2. I don’t want to spoil what happened in the All-Star match; instead you can go and watch its entirety here. When Techies will be available for public consumption is still yet unknown. Valve stated it would be sometime after the International is over, but an exact date is still to be announced. But one thing you can be assured of is that you’ll be seeing Techies in the majority of your games, in varying effectiveness. When Techies are officially out, check back for a detailed guide on how to play the hero to their maximum explosive potential. In the meantime read our day one review of the Dota 2 International main event, with day two soon to follow!